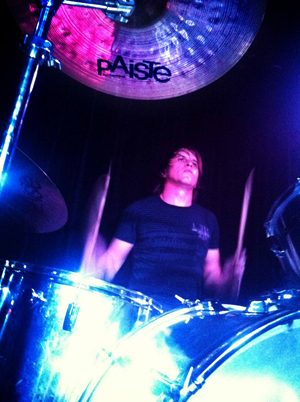 The Paiste 2002 and RUDE series are great for cutting through the many instruments we have in the band, particularly the 20" 2002 crash and 22" 2002 china. The Red Paintings was formed 2002 in their home town of Brisbane. The name The Red Paintings was inspired by art itself, the ability to create a landscape from every song that is written, songs that have the ability to tap into the public's craving for something new and ground breaking. In their short history the band has some major acheivements including the main support for The Dresden Dolls (USA) sold out tour of Australia, NZ, U.S.A, UK in 2006. The band also performed an exhausting six national headlining tours in 2004/2006, and in 2007 took their show around the country once more. Their 'Destroy The Robots' album debuted at #86 on the ARIA charts, #3 on the Air Charts, and had first and second pressing sell-out through Song/BMG. Festival appearances include the Great Escape Festival, Valley Fiesta, Livid Festival and Bid Day Out, and the band has toured the USA, China and Hong Kong. The Red Paintings are always working on creating the buzz to their current fans and future fans world wide, with Andy forming a crucial part of the group's onstage energy.